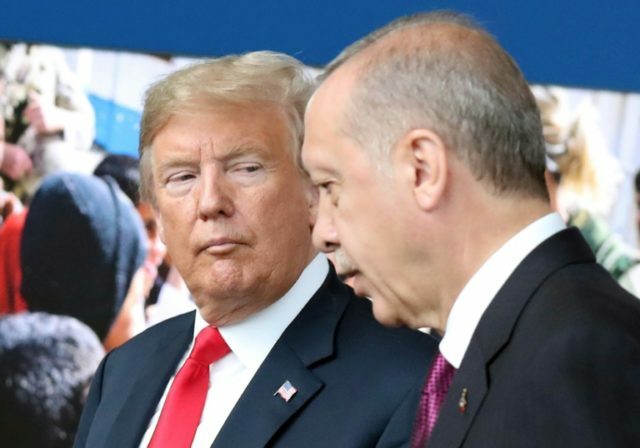 The agreement between Turkey and the United States to push U.S.-allied Kurdish militiamen out of Syria’s Manbij region is delayed, “but not completely dead,” Turkish President Recep Tayyip Erdogan declared, the Hurriyet newspaper reported on Thursday. “There is a delay but [the deal] is not completely dead. U.S. Secretary of State [Mike] Pompeo and Defense Secretary [Jim] Mattis say they will take concrete steps,” Turkey’s Hurriyet quoted Erdogan as saying, according to Reuters. Erdogan reportedly made those comments while traveling back from a visit to Hungary on Tuesday. In recent weeks, Turkey has accused the United States of delaying the withdrawal of the Kurdish People’s Protection Units (YPG) from Manbij as part of the deal. “But, of course, as we continue in implementing the roadmap, there are specific activities within that to ensure that that is the case. And I think that will occur in due course as we continue to implement the implement the roadmap,” he added. Early this week, the Manbij Military Council (MMC), a component of the YPG-led Syrian Democratic Forces (SDF), dismissed Turkis state media reports suggesting that the Kurdish militia was refusing to leave Manbij and making preparations to defend the town against Turkey’s occupation. Recently, statements have been made by Turkish officials attacking the MMC because it is digging trenches and establishing earth mounts in the city within a systematic media campaign that aims at misleading the public opinion and instigating unrest. We have taken all security and military measures to protect the city from the attacks of the terrorist organizations so that we can be a source of confidence for the people today that they are relatively safe from the terrorist operations for thousands of people to return to their villages and towns…We have the right to work for protecting the stability and safety of our city. Following months of a stand-off between fighters from the U.S.-backed SDF, predominantly made up of YPG fighters, and Turkish-allied opposition fighters, Turkey and the United States reached an agreement to reduce tensions in May. Ankara has threatened to force the YPG fighters out of Manbij if they do not leave the area on its own accord. Turkey considers the YPG to be an affiliate of the Kurdistan Worker’s Party (PKK), which both Ankara and Washington have labeled a terrorist organization. The United States has infuriated Turkey by continuing to lend support to the Kurdish fighters in their fight against the Islamic State (ISIS/ISIL). Under the deal, the YPG militiamen would pull out from Manbij, and Turkish and American troops would maintain security and stability in and around the town. Turkish and American forces have already begun conducting coordinated but independent patrols in Manbij as part of the deal, Reuters noted. Turkish Defense Minister Hulusi Akar said Tuesday that joint training of American and Turkish soldiers for patrols in Manbij had begun, the state-owned Anadolu news agency reported.